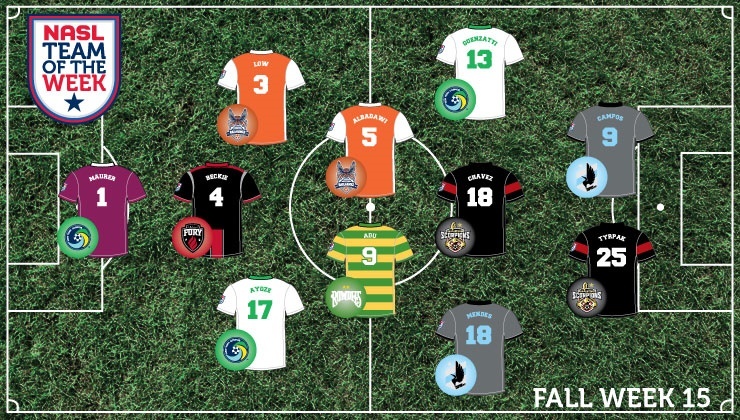 Minnesota United forward Pablo Campos, New York Cosmos goalkeeper Jimmy Maurer, and Tampa Bay Rowdies midfielder Freddy Adu provided their teams with key performances in the race to The Championship in Week 15 of the Fall Season. Campos helped the Loons clinch a postseason spot, Maurer’s two clean sheets moved the Cosmos into position for the top seed throughout the postseason, and Adu led the 10-man Rowdies back into the fourth and final berth with an assist on a late goal. GK: Jimmy Maurer (New York Cosmos) – Maurer dropped his goals against average to 0.96 with two shutouts in two key victories for New York. The Georgia native made a number of important, acrobatic saves in the wins, particularly the double save in a 3-0 win over the Atlanta Silverbacks on the road. He then held FC Edmonton scoreless in another 3-0 victory. DEF: Ayoze (New York Cosmos) – The Spanish defender is always a tireless worker and was again in two important wins for New York. Helping keep two clean sheets, Ayoze made an impact in the attacking half, adding an assist against FC Edmonton with his corner that dropped to the feet of Raúl. DEF: Drew Beckie (Ottawa Fury FC) – While typically a defender, Beckie put in a strong shift as part of a three-man midfield. The Canadian helped stifle the Tampa Bay Rowdies during the match in the 1-1 draw. DEF: Kupono Low (Carolina RailHawks) – The RailHawks shut down Jacksonville Armada FC’s attack and the native of Hawaii had a big impact. Low helped keep a speedy Jacksonville attack in check for a clean sheet in a 3-0 win. MID: Nazmi Albadawi (Carolina RailHawks) – Albadawi put in an impressive performance for the RailHawks in the win over Jacksonville. The Carolina native cut the ball back to the top of the box to earn an assist on Tiyi Shipalane’s opener in the match, and made a decisive run into the box and tapped home Daniel Jackson’s cross to score a goal. Late in the match, the midfielder added a second goal in the convincing victory. 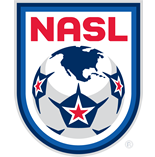 MID: Freddy Adu (Tampa Bay Rowdies) – The Rowdies were down a man against league-leading Ottawa, but Adu added a moment of magic to lift Tampa Bay to a draw. A creative hub in the midfield, the former U.S. youth standout scooped the ball over the top of the defense for Brian Shriver to slot home. It was a crucial assist for Adu, which put Tampa Bay in a postseason position. MID: Marvin Chávez (San Antonio Scorpions) – The Honduran international’s two assists were instrumental in the Scorpions’ 2-1 road win against Indy Eleven. He first slotted the ball to Giuseppe Gentile on a devastating counterattack and later laid off the ball into the path of forward Kris Tyrpak for the game-winning goal. MID: Sebastián Guenzatti (New York Cosmos) – The Uruguayan midfielder started twice last week and made the most of his chances. He scored the opening goal against Atlanta after beating the Silverbacks’ goalkeeper Steward Ceus at the near post in a win. He followed it up on Sunday with another game-opening goal, beating Matt VanOekel with a low shot to the far post in a victory that moved the Cosmos to the top of the Combined Standings. MID: Daniel Mendes (Minnesota United) – The Loons’ attack got off to a flying start against the Fort Lauderdale Strikers with two goals in less than a half-hour. The Brazilian midfielder was the beneficiary of a pass from his countryman Pablo Campos after he made a strong run. The goal proved to be the game-winner in a 2-1 victory over the Strikers and clinched a postseason berth for United. FWD: Pablo Campos (Minnesota United) – Campos led the forward line for the Loons and was heavily involved in the attack. He was in the right place to slot the ball in from close range after Justin Davis’ cross was deflected by Fort Lauderdale goalkeeper David Meves. He then laid the ball off for Daniel Mendes, who scored the eventual game-winning goal. The Brazilian forward was also named Player of the Week. FWD: Kris Tyrpak (San Antonio Scorpions) – The Texas native has had a fast start to life with the Scorpions and now has scored in each of his first two games. After scoring on a brilliant half-volley last week, Tyrpak fired in a low shot from the top of the box for the game-winning tally against Indy Eleven.